Coco Martin and Yogo Singh: Daniel and His Child Version Reunite! 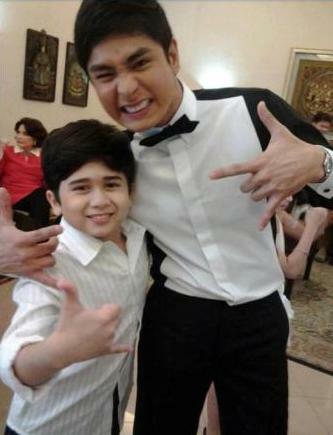 This is a photo of the two Daniel of the country's phenomenal hit TV series "Walang Hanggan!" The child actor Yogo Singh and Primetime Mainstream actor Coco Martin reunited during the "Walang Hanggang Pasasalamat" Concert in the big dome. The viewers were captivated by the charm of the child star Yogo as he played the young Daniel in the early episodes of the hit TV series. After playing the said character, Yogo landed a lead role in the ABS-CBN's fantaserye "Wako Wako." Coco's character in "Walang Hanggan" as Daniel is another remarkable character in the world of TV series. Coco already created different remarkable characters in different teleseryes like "Tayong Dalawa." "Kung Tayo'y Magkakalayo," Tonyong Bayawak," and "Minsan Lang Kita Iibigin."